This Steck Duo-Art reproducing piano #64261 was built in New York in 1920 and featured an Aeolian Duo-Art player that was also licensed for installation in grands by the Steinway and Weber piano companies. This Steck in 1920 retailed for less than the same sized Steinway model XR player, but it was still a luxury item costing more than the US average purchase price of a house. As this piano was built before the invention of the microphone, loudspeaker or radio, these reproducing players were the best recording medium for piano performances, and the Duo-Art coding system is a precursor of the modern MIDI protocol for digital instrument recording. 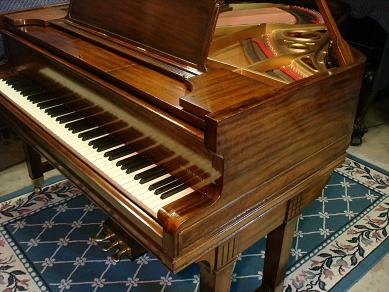 This piano came to HistoricPianos in largely untunable and unplayable condition, with a cracked pinblock and oversize tuning pins, worn-out hammers, a poor-quality case finish with significant damaged sections of mahogany veneer, poor-quality finish on the stringplate, and an entirely non-functioning player with missing parts, deteriorated leather, porous pneumatic fabric, and brittle or broken tubing. It was completely restored in 2009 with a new pinblock, new strings and tuning pins, all new stringing and damper felts, new hammers, keytop resurfacing, and a complete action repair and regulation, including advanced rebalancing to achieve an ideal, even touchweight, ideal for both playing by hand and for achieving high-fidelity performances of recorded Duo-Art rolls. The stringplate was regilded and relettered, and the case was repaired and refinished using a traditional oil-and-shellac French Polish finish. The player was completely rebuilt with new pneumatic cloth, tubing, etc., and was carefully regulated to achieve factory-new performance specifications. These days, few people have actually heard a well-regulated Duo-Art player system in a great-sounding piano, and this instrument sold to the first potential buyer who looked at it, a few days after the restoration was completed. I managed to make a few video/audio recordings of this instrument (some on this page and some in YouTube) before it was delivered to the new owner. These include both the piano played by hand and performing vintage Duo-Art rolls, but all filmed with an inexpensive digital camera so the video/audio quality may not completely represent how good the instrument sounds live.